Clinique, a global leader in beauty, continues to drive consumer service innovation by introducing new digital technologies at various points of sale. As the first dermatologist developed cosmetics brand, Clinique was founded on the philosophy that great skin can be created. Clinique continues its tradition by pioneering the connection between dermatology and cosmetics through a custom-fit beauty experience. Inspired by that heritage, Clinique becomes the first cosmetics brand to use the Apple iPad®1 in-store as part of a state-of-the-art, self-guided skin care diagnostic tool being rolled out this month at select counters nationwide. Guided self-service on the Apple iPad®. 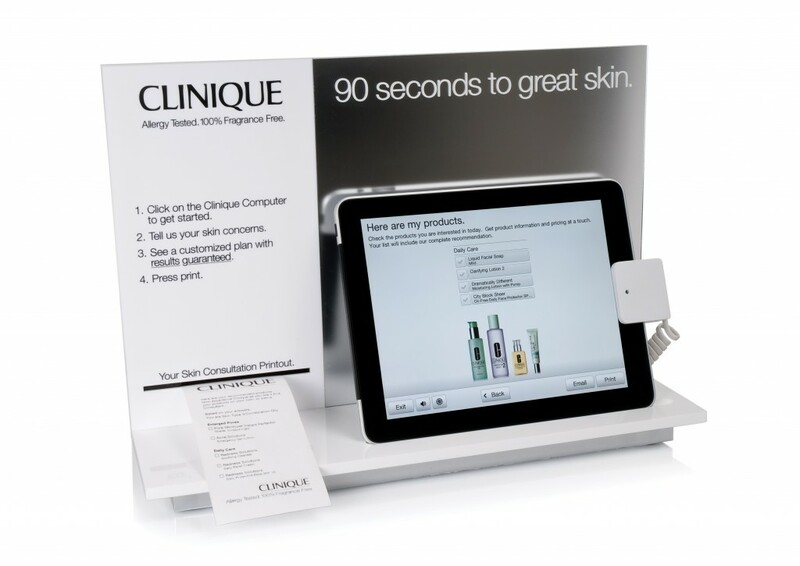 Using software exclusive to Clinique on the Apple iPad® at Clinique counters, consumers identify their skin care concerns and receive personalized recommendations using a 90-second computer-guided skin care analysis. The diagnostic tool processes over 180,000 product combinations that precisely match each consumer’s personal needs. At the end of the intuitive analysis, consumers receive a printout or email with a list of their custom-fit product recommendations. Clinique Smart Bar™ powered by Microsoft Surface®2. Clinique is the first beauty brand to use Microsoft Surface® in-store. The Clinique Smart Bar™, an oversized touch screen counter that can detect objects and gestures using the embedded Microsoft Surface® unit, is being installed this month at Bloomingdale’s flagship store at 59th Street in New York City. The new digital interface is perfect for groups browsing together or for the busy shopper who wants to pick up products and go. Consumers are introduced to an immersive, collaborative and fun shopping experience by placing specially tagged Clinique products on the Clinique Smart Bar™. After accessing product information, Clinique.com’s best in class user reviews and how-to videos, shoppers can easily add their favorite products to a virtual browsing basket. The user-friendly application allows shoppers to print out a barcode and present it at the nearby express service counter for quick checkout. If they choose, shoppers can socialize the experience by sharing the virtual browsing basket directly to their Facebook wall for all of their friends to see. An email sharing option is also available to ensure that consumers can easily access their product selections. Cutting-edge virtual makeover tools on Clinique.com powered by TAAZ technology. Clinique partners with award-winning virtual makeover website TAAZ.com, giving consumers the option to simulate skin care product usage over time. Currently available on Clinique.com for Clinique’s groundbreaking new product Repairwear Laser Focus Wrinkle™ & UV Damage Corrector, the online tool enables consumers to upload a photo and immediately see a simulation of results after using the product for 12 weeks. Utilizing advanced facial recognition technology, consumers can zoom in on the eye area and view their simulated results at 4, 8 or 12 weeks. Photos are never stored, but convenient Facebook and Twitter links make it easy for consumers to share the tool with friends. Clinique, a leader in the beauty industry, will continue to evolve the consumer experience by integrating digital, mobile and social media into the Clinique service as you like it concept.